Stress is common and can often be unavoidable. When life gets busy, we naturally become a little more stressed. Knowing how to manage stress can make a big difference in your overall health and well-being. April is Stress Awareness Month, which is a great time to consider your options for managing stress. At Prairie Life Fitness, we offer a number of programs and activities to help you destress and focus on your health. Yoga is a relaxing way to get your body moving and relieve stress. It is a total approach to health and fitness, focusing on a number of areas including balance, cardio, flexibility, strength and more. The slower pace and emphasis on controlled breathing and movement help to relax you during and and after the class. Pilates is another class to consider if you are looking for some relaxation. While it is more active than a traditional yoga course, it still provides stress relief. Pilates focuses on concentration, awareness, breathing and controlled movements. This mindfulness throughout the practice can help reduce stress as you strengthen and tone your body. Spending time in the water can be especially relaxing after a long day at work or school. Head to your local PLF to hop in the pool for a quick swim or take a water aerobics class. A little time in the pool may be just what you need to relieve stress. Sometimes life gets busy and it is easy to forget about self-care. Taking time to do the things you want can be a great way to de-stress. Go to the gym alone, run errands without the kids or just sit and read a book. Make it a goal to spend some time on yourself at least once a week and decompress. Stress Awareness Month is a time to reflect on how you relieve stress. After a long day, are you taking time to focus on yourself? Your local PLF is a great place to start working towards a less stressful lifestyle. Whether you choose to participate in a yoga class, get a massage or go for a swim, there are a number of ways to relax at PLF. Kick your fitness up a notch this spring with the 2019 Prairie Life Fitness Triathlon Challenge. Swim 2.4 miles, bike 112 miles and run 26.2 miles between the dates of April 1-15. Track your progress and motivate others to get their miles in. See the front desk to sign up now through April 1. Cost is $15 to participate and includes a limited edition t-shirt. 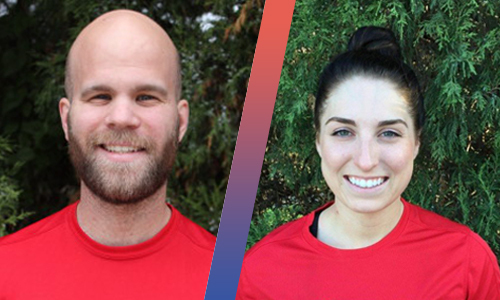 Certified Personal Trainers, Ben Welch and Brenna Geiger, from our 70th & A location in Lincoln will be taking over our Instagram feed on Tuesday, April 16. Make sure to follow @plifefit to follow along. 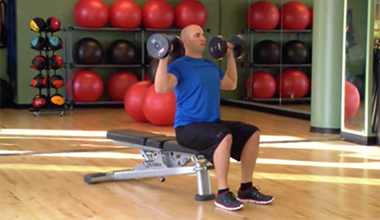 The dumbbell overhead press is a strength-building exercise that isolates the muscle groups within the shoulders. This workout helps to improve posture, balance and upper-body stability. By evenly distributing the weight on each side of the body, the dumbbell overhead press helps to correct muscle imbalances. Click the image above to learn how to effectively perform this highly beneficial exercise. Our PerFit personal training app lets you create and access personalized workouts at home, at the gym, and on-the-go.